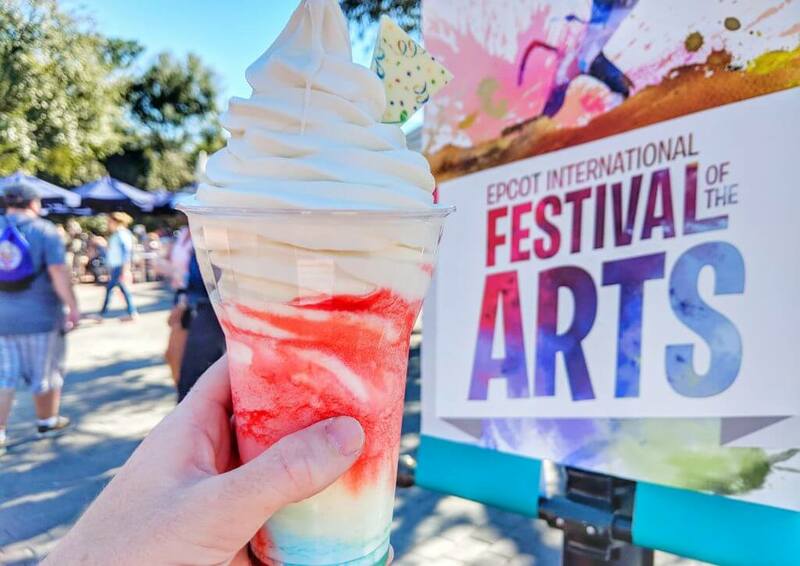 Epcot’s Festival of the Arts is back for its third year, and of course we were there on the first day to see what was new for this year. With amazing art, fantastic food, and performances by Broadway stars, this is one of my favorite Epcot festivals (and the fact that it’s held in winter when temperatures are reasonable makes it even better!) 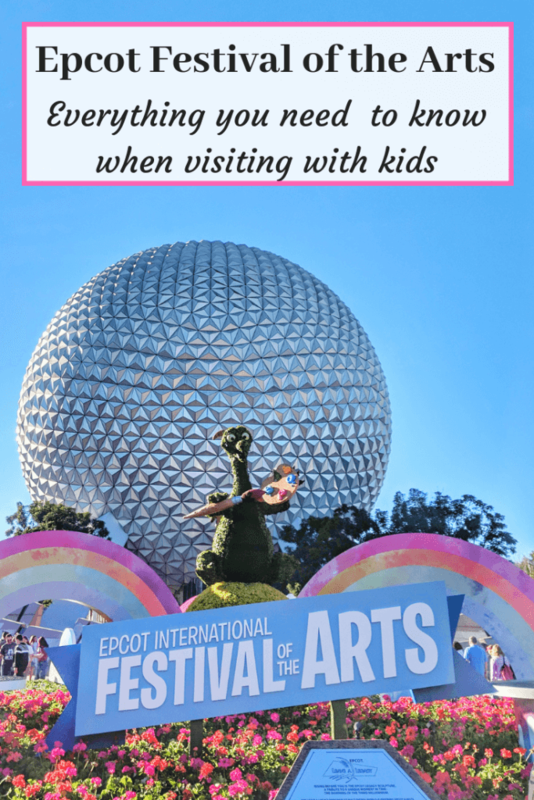 If you’re visiting Epcot Festival of the Arts with kids then read ahead for all you need to know about the best things to do, see and eat with little ones in tow. For more information on the other Epcot festivals, read through my posts on the Epcot Flower and Garden Festival, the Epcot Food and Wine Festival, and the Epcot International Festival of the Holidays. With the name being Festival of the Arts, you would assume that this would be the main focus of the event, and to some extent, it is. There are a number of seminars covering a wide variety of mediums going on over the course of the event; these include classes on animation, truffle making, floral arranging, jewelry making, and mixology. The seminars are an additional fee on top of park admission, and seats are limited so be sure to book ahead if you think you might be interested. To book a class, call 407-WDW-PLAY, and for a full list of the seminars available, go to the official Festival of the Arts website. I looked in on one of the classes taking place today, and it looked fantastic, although I wish there were just a few classes aimed more at a younger audience so the kids could get involved. Outside of the seminars, there is plenty of other art to look at and interact with. Festival galleries are spread out around World Showcase, featuring both Disney and non-Disney artists, showcasing a wide variety of talents. There are some really interesting artists showcasing amazing talents, including painting custom designed Toms shoes, candle making, and marbling. Harrison was really interested in some of these, and even though this wasn’t something the kids could necessarily get involved with, they were both interested to watch. There was plenty of unique merchandise for sale as well. There is also an amazing interactive mural being created in the World Showcase Plaza that we had a great time being part of. Guests are assigned a number, a pot of paint, and a paintbrush, and then instructed to paint five squares (only five!) with their number on – kind of like paint by numbers! Harrison absolutely loved this, and took great care both choosing his color and painting his squares. 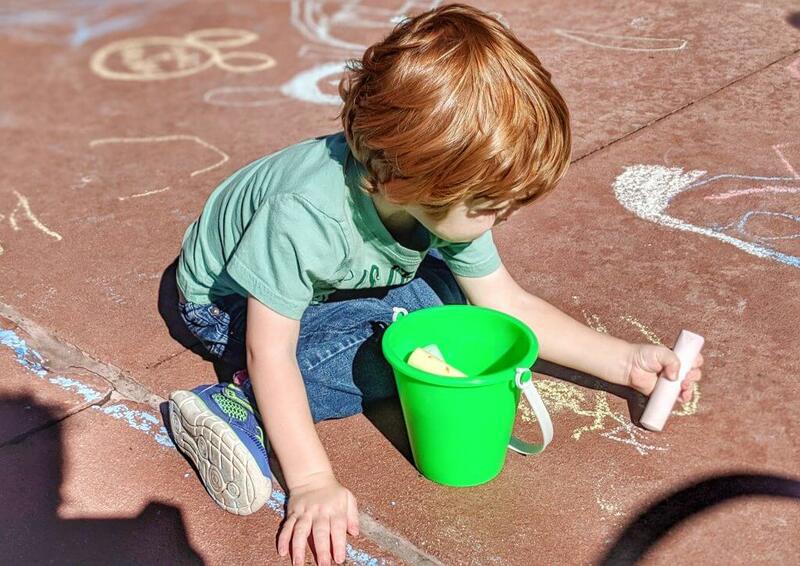 Grayson was very enthusiastic (and may have painted more than his five squares…) but he loves to color and paint, and this was a great way for him to get involved. There was a line to participate in this throughout the day so it seems very popular, and I can’t wait to see the finished product when it’s complete. There were also fantastic pastel chalk paintings, which were being worked on throughout the day. We got chatting to one of the artists who mentioned that she’d actually been terrible at art in school, but had really gotten into it since then and now it was her biggest passion, which I love. Again, my kids were really interested in watching the artists work and Harrison loved trying to guess what the finished product was going to be. There was even a kids chalk area next to the Wreck it Ralph playground where kids could play around with sidewalk chalk and be as creative as they like. Grayson was happy to play with this for ages! 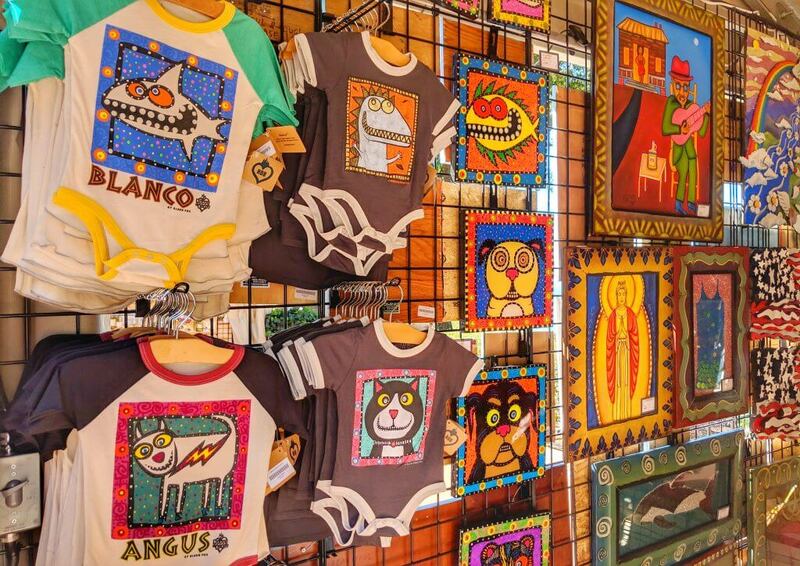 I did think that, since the galleries were in the World Showcase, that it would have been a good opportunity to display artists or traditional artwork from those countries. It was nice that some of the artists were there so you could talk to them; some were even creating masterpieces as you walked by. I really enjoyed the interactive nature of this part of the festival. Let’s face it: this was really why I was there. Epcot’s Food and Wine Festival in the fall always used to be the only place where the portable food kiosks popped up everywhere to offer new culinary delights, and then the Flower and Garden Festival in the spring got in on the action. With Festival of the Holidays finishing up the festival season, there are food booths in Epcot throughout most of the year at this point, and it’s always nice for some of the food offerings to be fresh and new. The food at the festival is fabulous! Where the Food and Wine Festival food has gotten a little repetitive over the years, the food here is an absolute standout. Not only are there some new and exciting options, but they are definitely part of the art experience. The food is beautifully prepared, with lots of really unique creations and some really fun deconstructed dishes. The fact that so much thought goes into the food presentation means that sometimes you do have to wait a little longer at the food booths for everything to be prepared, so do bear this in mind. 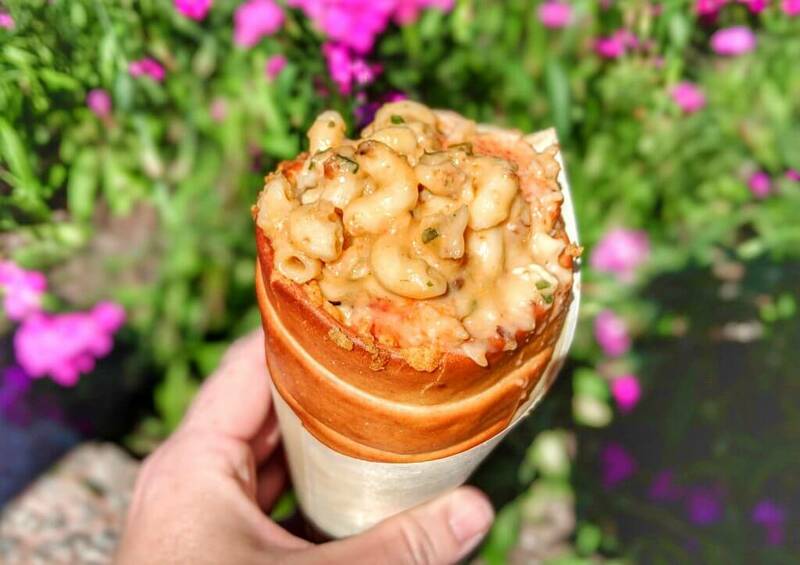 Lobster Mac and Cheese in a Bread Cone from Taste Track – this is a great option for kids since it’s nice and simple, but there was a really good amount of lobster in there too. 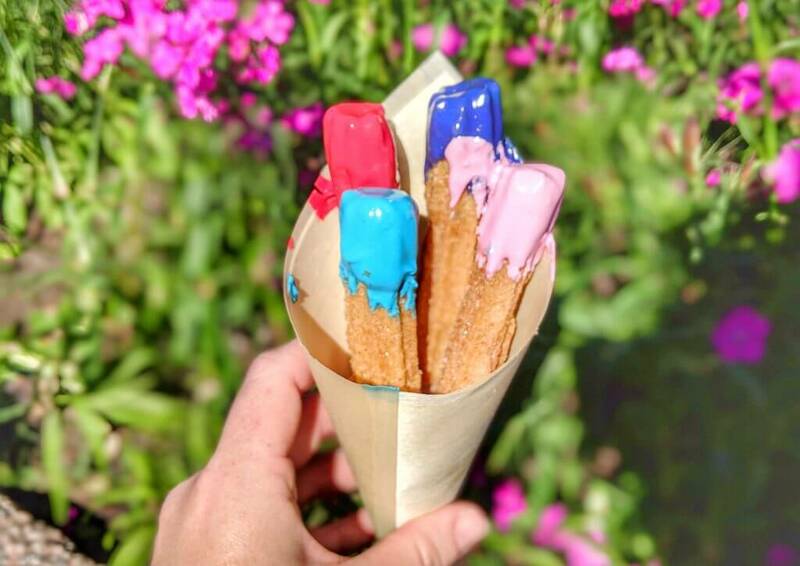 Paintbrush Churros from Taste Track – Grayson absolutely loved these, so much so that I didn’t even get one bite! They were a fun way to dress up churros a little. 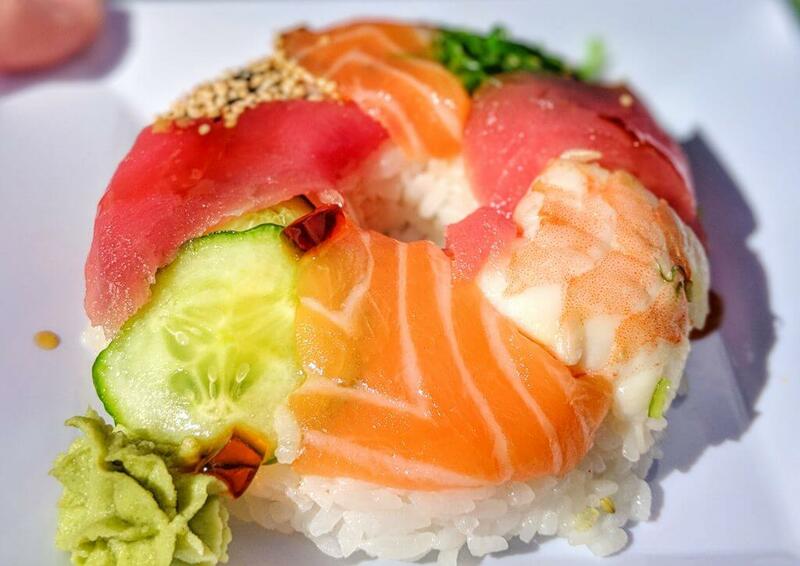 Sushi Donut from Takumi Table – this is a good option for kids who might be a bit more adventurous, and both Grayson and I really enjoyed it. We did have quite a wait for this since they’re handmade and time is taken to make sure they really do look beautiful but they were worth the wait. Magical Float from Fife & Drum Tavern – this was a great mix of sweet and creamy, and would be great for a warmer day. 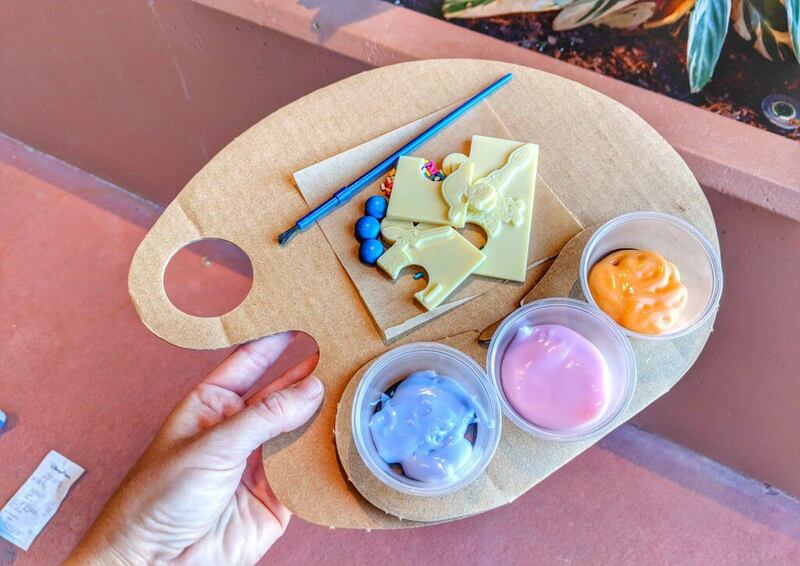 White Chocolate Figment Puzzle from The Painter’s Palate – this is a really cute white chocolate puzzle that comes with a paintbrush and different colored icing to paint the puzzle, as well as chocolate candies and sprinkles for a finishing touch. As was the case last year, Grayson had no interest in painting the puzzle, and instead simply ate the chocolate puzzle and used the paintbrush to spoon the icing into his mouth. Either way, he enjoyed it very much! As with any Disney special event, there is some new merchandise released, this time featuring the festival’s mascot, Figment. I’ve always loved Figment, and I love that he’s getting some attention outside of his ride (which I’m not the biggest fan of!) 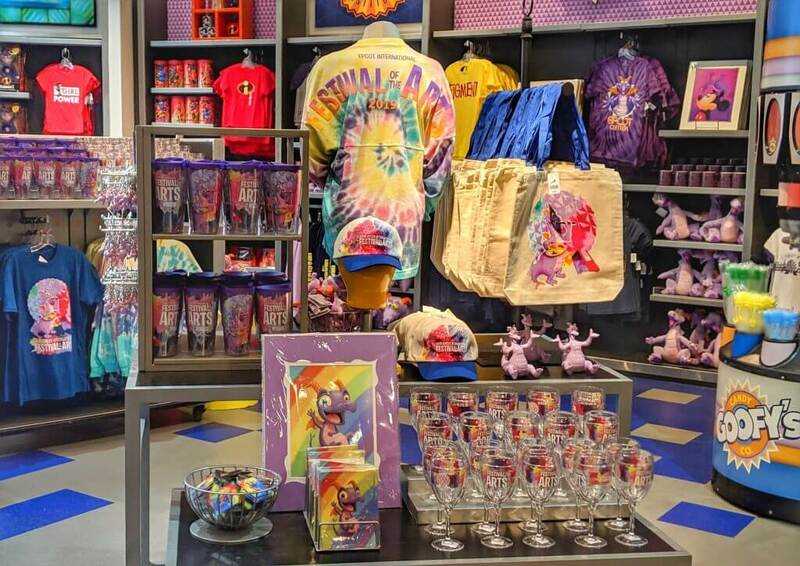 The merchandise includes things like t-shirts (including an exclusive Annual Passholder shirt), hats, mugs, travel mugs, and bags. My very favorite thing about Festival of the Arts (besides the food, of course!) 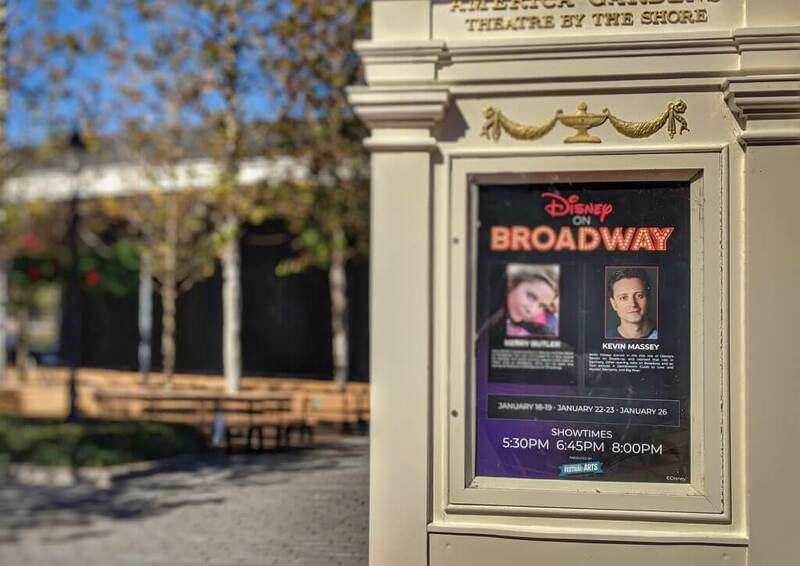 are the concerts featuring Broadway stars. I love musicals of all kinds, but I admit that I have a real soft spot for Disney musicals. In years past, the concerts have featured performers such as Ashley Brown, Josh Strickland, and Kevin Massey (all of who are returning this year) as well as some new artists this year like Gavin Lee and Arielle Jacobs. We always take the time to watch these concerts and they are always absolutely amazing, with stars singing songs not only from the Disney musicals they have been in, but other Broadway shows. Harrison is a huge fan of musical theater so this is one of his favorite things about the festival! There are three shows a night (at 5.30pm, 6.45pm, and 8pm) and the performers will change over the course of the festival. There is also a dinner package available at a variety of Epcot restaurants. For a list of performers and more information on the dinner package, go to the official Festival of the Arts website. Overall, this festival is a great addition to Epcot, and something I would highly recommend experiencing if you visit Walt Disney World while it is going on. January and February don’t typically have a lot going on at Walt Disney World, and it’s actually really nice to be able to experience a special event while crowds are a little lower, and temperatures are mostly very comfortable. There was a lot for the kids to see and do, and they both really enjoyed spending time at the festival. I really hope this is an event Disney continues to put on long into the future. Did you visit the festival this year? Let me know how you liked it in the comments below!